Earn 1079 loyalty points when you order this item. KEF T105 speaker system combines five deceptively compact model KEF T101s as the front and rear satellite speakers, along with T101C centre speaker and the discreet but powerful T-2 subwoofer. This 5.1 speaker package is powerful enough to fill most normal rooms with a compellingly detailed 3D sound image. 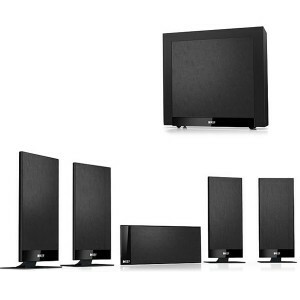 As easy to set up as they are on the eye, they make the perfect entry level surround sound system for the latest generation of flat screen TVs. With KEF’s new T Series, you get exceptionally slim profile speakers that generate all the intricacy, spaciousness and dynamic range of a high end conventional design. You’d expect no less from KEF. With some of the finest speakers in the world to our credit, KEF is a 50-year success story of innovation that includes unrivalled experience of home theatre: our multi-award winning systems have for years been the standard by which others are judged. No wonder even the most demanding listeners love the new T Series the first time they hear it – and when you discover the unique technologies crammed into each slender enclosure, you understand why!